After over 25 years of chasing fish on the fly it has become apparent that caddisflies or sedges may have been put on the planet to illustrate the diversity Mother Nature is capable of. With over 10,000 species worldwide and 1,400 in North America alone this complex and diverse order is unique to say the least. Within the 22 caddis families found across the continent lies a variety of sizes, shapes, colors and most importantly behaviours. All seem intended on driving fly fishers nuts. Egg laying adults diving beneath the surface, pupa emerging in a variety of manners and larva that crawl, swim or drift are just some of the caddis curve balls thrown our way. Despite their widespread abundance caddis take a back seat to the perceived glamour of stoneflies and mayflies. On running waters for example, caddisflies outnumber stoneflies and mayflies combined. Belonging to the order Trichoptera, literal translation-hair winged, caddis are distant cousins to the recognizable moths and butterflies. At first glance caddis adults, with their 4 tent like wings, and long antennae can easily be confused with these terrestrial cousins, especially when fluttering about. Caddis have a complete lifecycle consisting of egg, larva, pupa and adult. With the exception of the egg stage all other stages are of critical importance on lakes, rivers and streams. On average, caddis life cycles take 1 year to complete. There are few species with multiple cycles within a year and others with multi-year cycles taking 2 years or longer to complete. Radical size ranges further complicate matters. Hook sizes span from #28 Micro Caddis to gargantuan #6 October Caddis or Travelling Sedges. Seasoned caddis fans carry large numbers of caddis patterns, covering all 3 stages of importance. However, fly patterns from #16 up to #8 cover most situations. Caddis size within species is often determined by a variety of factors including latitude, water temperature and food availability, so stock a variety of sizes. Color coding is not much help either as caddis larva and adults span a wide spectrum including shades of green, olive, tan, yellow and brown. Shades of brown and tan are the most common pupal color followed by yellow and shades of olive and green. Contrasting color schemes are also commonplace. For example, large Limnephilidae pupa consisting of light green abdomens and rusty brown thoraxes emerge on many western stillwaters in the late spring through early summer months. Bright contrasting abdominal bands are also common some stillwater species. Capable of surviving in a wide variety of water temperature and oxygen conditions caddis are a hardy bunch. The challenge for fly fishers is determining what species might be available and then choosing the appropriate pattern and presentation technique. This complexity can be broken down in a couple of ways. Rick Hafele, author of the recently released, Nymph Fishing Rivers and Streams, breaks caddis down in to 6 behavioural groups; green rock worms, net-spinning caddis, lesser net spinning caddis, saddle-case caddis, American Grannom and cased caddis. Fly fishers wishing to simplify Rick’s behavioural groupings can refine identification further without getting too far off base into free living, net spinning and case makers. Fly fishers wishing to determine which caddis might be available should focus their identification efforts on the larval stage. The pupal stage is often short lived and the chances of a fly fisher observing one is often remote. Other than size adult identification can be challenging too. Caddis larva typically progress through five moults before pupation. Depending upon species and actual the actual developmental stage within certain species caddis larva feed by grazing, scrapping, foraging, scavenging and preying on other organisms and aquatic insects. Some species begin with a vegetarian slant becoming entirely predaceous during their last instar. Caddis larva breathe though a combination of hydropneustic and cutaneous respiration and as a result are most prolific in moving water. Free living caddis species such as the green rock worm are considered to be the least evolved of the caddis clan. Inhabiting the riffle stretches of rivers and streams in near epidemic proportions Unencumbered by nets or cases these grub-like (as are all caddis larva) predacious larva clamber about the bottom in search of prey. This habit exposes themselves to higher members of the food chain such as trout, especially when swept downstream. Green rock worm imitations make ideal searching patterns when high-sticking nymphs on rivers and streams. To add a twist to the free-living group one family, Micro Caddis, starts as a free living larva and then constructs cases during their final larval stages. Micro caddis are so tiny that many fly fishers refuse to imitate them but there are times when fish focus upon Micro Caddis on all three stages important to the fly fisher. A step up the evolutionary ladder lays the net spinning behavioural group. These vegetarians construct silken nets along the bottom substrate of rivers and streams seining food from the current. Species such as Hydropsyche are the most widespread of all caddis species found on rivers and streams, even more so than their rock worm relatives. Coating the surface of just about every rock in a riffle these caddis are easy to locate by picking up a few stones and looking for their small nets. In crowded conditions Hydropsyche protect their territory by rubbing their upper legs against a serrated ridge on the underside of their heads warning potential invaders, a unique trait amongst aquatic insects. If conditions become too crowed larva simply let go and drift downstream in search of a new accommodations. This behavioural drift often takes places during daylight hours separating caddis from mayflies and stoneflies which typically drift during early morning and late evening hours. 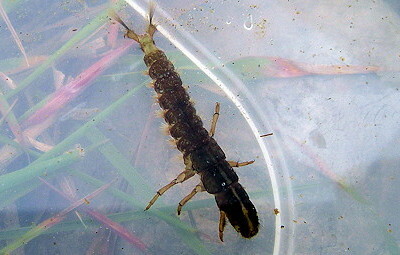 Hydropsyche larva, as with all caddis, are feeble swimmers, riding the current in a hunched posture. Fly fishers using curved scud pupa hooks can be particularly successful. Imitating drifting free living and net spinning larva is the cornerstone of the Czech Nymphing method that has become increasingly popular on moving waters, North America wide. Fly fishers collecting caddis may be confused as to whether a sample is either a net spinning or free living larva. Free living caddis heads are narrower than the balance of their bodies. Net spinning caddis on the other hand, feature wide heads that are often darker than their bodies. Filamentous abdominal gills are also prevalent on many net spinning larva. Saddle case makers, a transitional group between true case makers and free living and net spinning species construct turtle shells of rocks, pebbles and other small particulate on rocks and stones along the river bottom. Fly fishers should look for these small domes as a sign caddis species such as Glossosoma are present. As with all river dwelling caddis, saddle case makers drift when they out grow their homes. This habit often results in large numbers in the drift as they all tend to outgrow their existing saddle cases at the same time. Cased caddis are the most evolved of all caddis species. As their name would indicate cased caddis larva fashion protective cases from a host of different materials. Material selection is often dependant upon where the caddis live. In swift flows, sand, small rocks and pebbles predominate. Stillwater cased caddis species utilize buoyant or neutral materials including twigs, pine needles and aquatic vegetation. The cases or retreats are constructed in a species specific manner and can be used as an identification key for many cased caddis families. It is challenging however, to take identification below the family level as many cased caddis species, particularly those that inhabit moving waters build their cases from a variety of materials depending upon their growth stage and habitat areas. This trait is common with October or Fall caddis. During their initial larval stages October Caddis inhabit slower leaf strewn sections and their case materials match this environment. As the larva matures they migrate to swifter areas of the stream and their cases feature heavier materials such as pebbles and sand to act as ballast against the current. Cased caddis undulate their bodies within their cases creating an oxygen enriched current to breathe. This trait allows cased caddis to survive in a wide variety of conditions including slow moving backwaters, stillwaters and areas of higher water temperatures. As a result cased caddis are the most widespread of all caddis species particularly east of the continental divide as rivers and steams in this region tend to have slower flow rates. As cased caddis larva grow they typically extend their homes through a series of additions. Some species do change residences and construct new cases. Stillwater species are known to vacate their cases when startled or threatened. Larvae sans case are easy pickings for foraging trout. Probing stillwater shoals with larva imitations during the early spring and late fall is a productive tactic as weed growth is low and trout find larval imitations easy to find. Don’t think however that trout only dine on homeless cased caddis. Trout pluck case and larva without hesitation. Stomach analysis reveals trout apparently dining on salad and rocks when in reality these items are just the slow digesting remnants of the cased caddis. The soft larva is digested quickly. As with net spinning and free living species cased caddis frequently let go of the bottom and drift downstream. The drifting larva peaks out of the case as if looking for a suitable place to live. Trout key in on this peaking behaviour and cased caddis patterns featuring bright abdominal segments are strongly recommended. 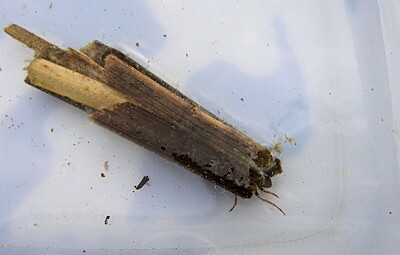 Other cased caddis species such as Brachycentrus suspended themselves downstream on silken cords. Leptroceridae species on the other hand are capable swimmers sculling around sunken weeds and debris searching for food and new resting areas. Upon reaching maturity the larva seals itself within its case or in the case of net spinning and free living families creates a pupal chamber in which a remarkable transformation occurs over the next 2-3 months. The grub-like larva grows elongated antenna and legs, develops wing pads and swaps annals appendages for reproductive organs. With the transformation complete the pupa or more accurately pharate adult cuts itself free drifting and tumbling about the bottom gathering trapped air and gases to aid their emergence ascent and adult transformation. Early in the emergence cycle drift pupal patterns near the bottom or in lakes creep them on or just above the bottom. This tactic adds mileage to any caddis hatch. Trapped air and gases in place the radiant pharate adult uses its elongated feather-like hind legs to scull toward the surface in series of short bursts and rests, often during the low light hours of morning or evening. Once at the surface emergence typically happens quickly resulting in aggressive swirling rises by trailing trout. Swinging or stripping wet flies and pupa specific patterns through pods of surfacing trout can be nothing short of spectacular. Some species scull toward shore to emerge in the near shore shallows or in some instances crawl out of the water for their final transformation. To further aggravate matters these three emergence traits may be present in one species. Once emerged, most adults fly off to shoreline vegetation to mate. Some species, particularly those inhabiting lakes scurry and scamper prior to flight. Leaving speedboat wakes for trout to home in on. Many adults are obliterated in heart stopping rises. Adult caddis seldom stray far from their natal waters and are capable of surviving weeks after emergence as they are able to ingest liquids. Caddis returning to the surface for a drink can be easily mistaken for a hatch. Be sure to check for pupal shucks as hatch confirmation. After mating egg laden females return to the water completing the cycle. Caddis lay their eggs using a variety of approaches. Some species flutter and dance across the surface depositing their eggs with each dab and driving trout to fits. Skittering adult patterns across the surface seduces numerous trout. A small minority of caddis lay their eggs on overhanging vegetation where the eggs hatch. Once hatched the larva crawl or drop into the water to carry on their lifecycles. The majority of caddis lay their eggs beneath the surface by diving below enveloped in a shiny air bubble, a key pattern trait. As with drinking caddis, egg laying females can be mistaken for a hatch resulting in incorrect fly choice and presentation tactics. Observation is critical to success. Fast moving freestone rivers and streams featuring rocky bottoms are prime October Caddis habitat.